Oreos, chocolate, and conversation hearts. 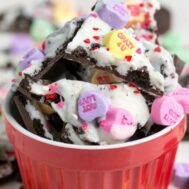 This bark will be a hit this Valentine's Day! Add chocolate candy to a microwave safe bowl and heat in 30 second increments, stirring after each, until melted and smooth. Pour onto prepared cookie sheet and spread flat, into an approximately 7x10 rectangle. Sprinkle with chopped Oreos. Chill for 10 minutes. Add white chocolate to a microwave safe bowl and heat on 50% power in 30 second increments, stirring after each, until melted and smooth. (I use 50% power for white chocolate because it’s so temperamental!) Pour over Oreos and spread to the edges of the milk chocolate. Sprinkle with chopped conversation hearts and sprinkles. Chill until set, break into pieces and serve or package to give!